Sipadan Island, the most famous island off Borneo, is a diver's dream destination. We offer day trips from Semporna to this truly remarkable island that sticks out of the 600m deep Celebes Sea. At Sipadan turtles can be seen on every dive but even while snorkeling there is a good chance to see some of these breathtaking creatures. 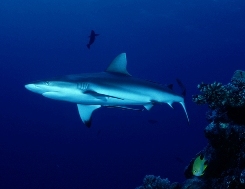 The active scuba diver might see as many as 7 different kinds of sharks. At sipidan Barracuda Point, perhaps the best dive site of all, a tornado of Barracudas can often be spotted darkening out the sun while schooling jacks and giant hump head parrotfish are also regular sights. At South Pt. hundreds of hammerheads and the very rare thresher sharks often patrol at depth far off the wall while the Drop Off offers a great view down the 2000 foot wall. 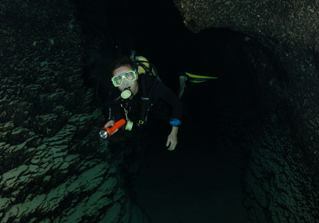 For experienced cave divers we also arrange dives to the famous turtle tomb, a 200m long cave system with a large number of turtle skeletons that got lost in the cave while looking for a place to rest. The boat trip from our base in Semporna takes little more than 1 hour by speed boat and we offer 3 dives daily at various dive sites in Sipadan.